On a very early Sunday morning, the sun positioned just high enough to displace some of the morning's darkness, a large number of volunteers' cars were parked along the roadside of Ault Park in Cincinnati, Ohio. A few show cars arrived early and were ushered onto the vast show field where they would spend most of the day. Polishing, cleaning, and detailing began immediately. Volunteers tended to various duties, and although this event takes place only once per year, it ran as if it were done on a daily basis. Even during the very early hours of the morning, the temperature had many worried. It was hot and there was very little breeze. As the day progressed, the heat continued to escalate. Many frequently visited the drinking fountains and shaded areas. This year's event featured Grand American Classics. In addition, there were sixteen other classes of automobiles ranging from brass-era antiques and full classics, to racecars and modern supercars. All net proceeds of the event benefit The Arthritis Foundation, Ohio River Valley Chapter. Many themes and special celebrations have continued to evolve the definition and expectation of 'Concours d'Elegance' shows. In translation, the words 'Concours d'Elegance' mean 'a parade of excellence,' which is what one would expect to see at these types of events. Another common element to all concours shows is education through the lessons of history. It is often said that 'you cannot know where you are going, if you do not know where you've been.' Another similar quote is 'Study the past if you would divine the future.' 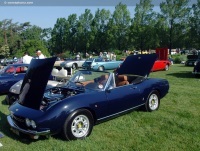 These profound statements are at the foundation for concours d'Elegance events. This theory was proven true at the Ault Park Concours, which showcased the 'Microcar', among other categories. The minimalist micro-cars are miniature vehicles designed as utilitarian transportation often having the capacity to carry one or two individuals. There is little room for much else, including luggage. In an effort to minimize space, and increase aerodynamics, these are not the most elegant vehicles found on the road. Most of the cars in the Micro-Car category were about the size of a Chihuahua and the tires no bigger than a donut. Many spectators, feeling the pain of current gas prices, often mumbled, 'so these are what we will be driving in the future?!' The prospect of nearly a hundred miles-per-gallon had many more optimistic about trading in their SUVs. One modern example sat amongst the mix; it was a Smart Car which has recently received the highest ratings from the Insurance Institute for Highway Safety (IIHS) for front and side crashworthiness. These Smart cars are a little over 8 feet long, five feet wide, have a top speed of about 90 mph, and get around 40 mph. Though not as extreme, most major automakers have shifted production away from large SUV's and trucks, and focused heavily on small, compact vehicles. Sitting in close proximity to the Micro Car display was a 1919 Detroit Electric. The car is powered by fourteen 6-Volt batteries that provide 84 volts to the motor. The Detroit Electric was produced from 1907 through 1939 by the Anderson Electric Car Company in Detroit Michigan. The cars were advertised as reliably getting 80 miles (130 km) between recharging, though top speed was typically not more than 35 mph. Steam powered vehicles of the same era were another viable alternative to the combustion engine and had similar capabilities to the electric car, though, one example (the Stanley Rocket) achieved around 150 mph on Ormond Beach in 1907. A hundred years later, automakers continue to work on ways to perfect this technology for modern day use. Some times the waves of the future are ripples from the past, after all. Perhaps the most special vehicle on the field was the Marmon Wasp, the first car to win the Indianapolis 500. It is only on very rare occasions does this vehicle leave its permanent home at the Indianapolis Motor Speedway. The first Indianapolis 500 race was held in 1911, though the Speedway property was completed in 1909. This means that 2009 will mark the 100 year anniversary of the raceway, and officials are planning centennial celebrations. The Marmon Wasp, driven by Ray Harroun in 1911, outpaced 40 entries from the United States and Europe with an average speed of 74.602 miles per hour. Ray started in the 28th position, but it had the advantage of being the first single passenger race car and also the first vehicle of any type fitted with a rear view mirror. The oldest car in this category was the Stoddard-Dayton, a car driven by Jap Clemens. It participated in the first races at the Indianapolis Motor Speedway in 1909. The leading investor of the Indianapolis Motor Speedway was Carl Fisher who was also the Indiana distributor for Stoddard-Dayton. Stoddard-Dayton is noted for being the first pace for the first Indianapolis 500 race in 1911. Surrounding the Marmon Wasp on concours day were several other Indy cars. The 1976 Lightning Indy Car was driven by Janet Guthrie at the 1977 Indy 500 race. Guthrie qualified at a speed of 188.403 and finished 29th due to timing gear trouble. She became the first woman to qualify for, and compete, in the Indianapolis 500. She later competed in the Daytona 500. In 2006, after an impressive career filled with outstanding achievement in her sport, Guthrie was inducted into the International Motorsports Hall of Fame. She was one of the first athletes named to the Women's Sports Hall of Fame. Her helmet and driver's suit from the historic 1977 race are on display in the Smithsonian Institute. At this year's Ault Park Concours, Janet Guthrie's accomplishments and racing career were honored and recognized by having her participate as the 2008 Grand Marshall. She was reunited with the car that she drove in her first Indy race. Robert McConnell's 1967 Vels Parnelli Jones Indy Racer was chosen by the judges as the Best in Class in the 'Historic Indy Cars' category. It was also a class winner at the recent Amelia Island Concours d'Elegance in the 'Cars of Parnelli Jones' category. The concours reserved several categories for 'Grand American Classics' automakers (1925-1948), including Packard, GM (LaSalle, Cadillac, and Buick), Auburn/Cord/Duesenberg, and Lincoln/Chrysler. A separate category was reserved for Independent Automakers. All of these groups were well represented, and showcased several examples of American production that focused on large and powerful, custom coach-built vehicles that were fitted with luxurious interiors. These were marque's that continually redefined style and are remembered as some of America's true icons. This year, the judges chose the 1931 Chrysler CG Imperial with a Lebaron bodied Convertible Coupe as the 'Best of Featured Marque' and a Best of Class award in the 'Lincoln/Chrysler' category. The car is owned by Brent Merrill of Toronto, Ontario. Some of the categories must have been very difficult to judge, as they encompassed 'all years', and thus, included a vast variety of vehicles. These included the Micro Cars, Historic Indy Race Cars, Racing, and Collector Asian. It must have been difficult analyzing each of the vehicles accomplishments, condition, pedigree, significance, and several other factors to determine the Class Winner. Maybe one of the harder classes to judge was the 'Collector Asian' category, a group not often seen at concours events. The difficulty would be in the eclectic mix of vehicles, which encompassed museum pieces covering the early years of Toyota production, to a Datsun 240Z, and a fairly modern, low production Nissan 300ZX Twin Turbo. It was a comparison of vehicles from the late 1950s to the early 2000s. Ultimately, the judges chose the Twin Turbo Nissan 300ZX, which was the fastest car in the group, and the one that had the most potential to bring a smile while driving. It is number 11 of the 104 specially built 300ZX TTs, constructed to commemorate the 25th Anniversary of the Nissan Z. The 365 horsepower engine is capable of carrying the car from zero-to-sixty in a mere 5.3 seconds with top speed electronically limited to 155 miles per hour. An equally strong contender in the group was the sporty and elegant 1967 Toyota 2000 GT (a frequent visitor to the Ault Park Concours), of which only 337 examples were produced. Perhaps the rarest, due to low production numbers and the age, was the Toyopet (Toyota) Crown Sedan of which only 287 examples were sold in 1958. It was, perhaps, the most significant in this category as it was the first attempt by a Japanese auto manufacturer to enter the US market. The 'Chairman's Choice' award went to the 1933 MG L1 Magna Police Car owned by Bill Richey. Eight L-1 Police cars were built, but only two have survived. This example, complete with period correct Police livery, is undoubtedly the finest example in existence. The 1939 Packard Twelve 1707 Formal Sedan (Ironically having a 'Do Not Judge' poster in its window) owned by Robert Westerman, was awarded the 'Founder's Trophy.' This award, awarded by Mrs. Helen Williams, is given to the vehicle best exemplifying the spirit of the original Concours d'Elegance, an event for car enthusiasts who love to drive their cars. The 'Open Coachwork' Trophy went to John O'Quinn's 1941 Packard with Victoria Convertible coachwork by Darrin. The Most Elegant Closed Coachwork award went to the Judkins bodied Lincoln KB owned by Dr. Wellington C. Morton. The 'Judges Choice' award went to the Isotta-Fraschini Tipo 8A SS owned by Peter Boyle. The Preservation Award went to the 1918 Buick E-49 owned by Robert Anderson. These types of awards have been gaining momentum in many events over the past few years, in an effort to preserve vehicles' originality. In many cases, cars are over-restored and much of the originality is lost. Even the Pebble Beach Concours now has a category that highlights originality and preservation of the past. An ongoing theory that the more unusual, odd, or flamboyant a vehicles design, the more likely it will win the 'People's Choice' award. This theory was reinforced when the people chose the Tatra T77a, owned by John Long, as their favorite. This Czechoslovakian coach-built vehicle was developed by Hans Ledwinka and Paul Jaray, the noted Zeppelin aerodynamic engineer. It has a sloped 45-degree three-piece windshield - fenders, headlamps, door hinges and handles integrated into the body. In the rear is a large tailfin and a rear-mounted Hemi V8 engine. This aerodynamic Limousine has a drag coefficient of just 0.212. As the day wore on and the sun continued to bake all those who dared to venture out from under shade, it was finally time to announce the Best of Show. Would it be a Duesenberg, a Packard, a Lincoln, a Cadillac, or the Isotta-Fraschini? The car chosen was very deserving; it instantly captured the attention of those that witnessed it rolling into the park. Some of the vehicle's most striking features are in the front. The 'waterfall' grill is unique to this car and a statement of the modern times. Behind the elegant and intriguing front design lurks a supercharged eight-cylinder, twin overhead cam engine that produces 220 horsepower. The tear-drop fenders on the front wheels are mimicked by the design of the long, and flowing tapered rear end. The history of the car is equally mesmerizing, having been owned by an Olympic skater; later the body and chassis were separated. Recently, all the original parts and pieces have been restored. Since that time, it has been collecting awards wherever it travels. The judges chose the Bugatti Type 57C Roadster with coachwork by Voll & Ruhrbeck as their favorite and most deserving. The Bugatti pedigree, the potent Type 57C engine, the graceful Voll & Ruhrbeck body, and the superb restoration made this the Best of Show. The car is part of the The Patterson Collection. 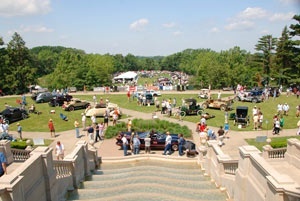 The 31st Annual Ault Park Concours d'Elegance was another spectacular event, with beautiful weather, great scenery, and a fine collection of automobiles. The Concours weekend began with a Grand Gala Welcome Party held at the Greenacres Arts Center historic estate. There was a Countryside Tour which began at Mariemont Square, (another historic district of Cincinnati), and was followed by Zakira's Garage Party. The following day was the Concours, Automotive Art Show, and Fashion Show. The conclusion of this weekend celebration was the naming of the Bugatti Roadster as the Best of Show. After 31 years, the event is still going strong.